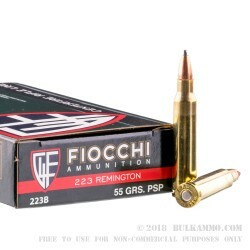 This 200 round case of .223 Remington cartridges from Fiocchi will help you hone your AR-15 skills at a great price. They also work great with the Bushmaster ACR, Ruger Mini-14 and other .223 and 5.56 NATO rifles. Clean-shooting and accurate, these rounds are comparable to M193 ball and use a typical 55-grain full metal jacket bullet. Expect a muzzle velocity of around 3,240 feet per second. 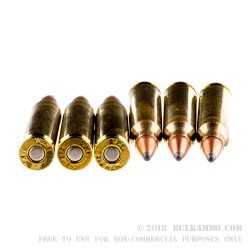 Each round uses Boxer-primed reloadable brass cases. 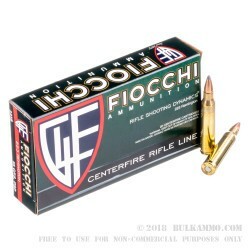 Fiocchi Munizioni is a private, family-owned ammunition manufacture headquartered in Lecco, Italy. The company has extensive experience fulfilling NATO ammo contracts as well as producing cartridges for hunting and sporting purposes. 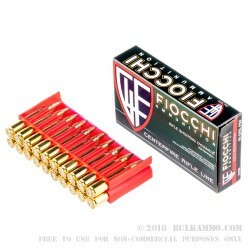 Fiocchi’s US division, built around its production plant in Ozark, Missouri, was established in the 1980s and has enjoyed strong success thanks to the company’s ability to produce ammunition that meets or exceeds the high expectations of American shooters. Q: Will these attract a magnet? A: Hello Kevin, This ammunition is loaded with a copper jacketed, lead core projectile and does not contain any steel.